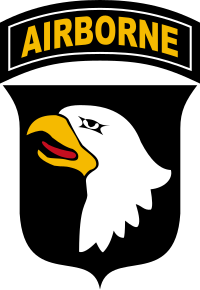 U.S. Army's 101st Airborne Division, "Screaming Eagles"
The 101st Airborne Division is an infantry division in the United States Army. It was called an "airborne" division because, as a paratrooper unit, it used airplanes to go into battle. It is most famous its defense of Bastogne at the Battle of the Bulge. The division later fought in the Vietnam War, including the Battle of Hamburger Hill. It also fought in the Gulf War, War in Afghanistan, and War in Iraq. The 101st Division was organized 2 November 1918 at Camp Shelby, Mississippi. World War I ended 9 days later. The unit was disbanded on 11 December 1918. The unit was made active again on 10 September 1921, at Milwaukee, Wisconsin. They were assigned to the United States Army Reserve. At this time the "Screaming Eagle" nickname became associated with the division. They assumed several traditions as a successor to the volunteer regiments of the American Civil War. In order to reorganize the 101st as an airborne division in the (regular) U.S. Army, the reserve division was disbanded on 15 August 1942. The 101st Airborne Division was activated in the U.S. Army on 16 August 1942. This was at Camp Claiborne, Louisiana. On 19 August 1942, its first commander, Major General William C. Lee, promised his new recruits that the 101st had "no history but had a rendezvous with destiny." On D-Day (6 June 1944) the 101st Airborne Division parachuted behind the enemy lines in back of Utah Beach. They cleared a path for the beach landings and captured several key objectives. The division took part in Operation Market Garden (17–25 September 1944). This was the largest airborne operation of all time. ↑ 1.0 1.1 1.2 "Lineage and Honors Information: Divisions". U.S. Army Center of Military History website. Retrieved 14 March 2012. ↑ "U.S. Army Divisions in the ETO". U.S. Army Center of Military History website. Retrieved 14 March 2012. This page was last changed on 21 December 2018, at 17:20.